If you've got relatives in Gondor or the Shire, you might want to call them and check they're OK. The Hungarian authorities have recently conducted a test of the country's emergency broadcast system. That wouldn't ordinarily be newsworthy, but the Hungarian test is a little unusual: Rather than some use real places, or just a generic test message, the Hungarian disaster management agency decided to use locations from the Lord of the Rings books instead. 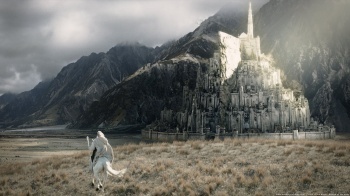 Messages on Hungarian state television and radio warned citizens of terrible storms hitting Gondor, Rivendell, and other places from Tolkien's Middle-Earth books, which were causing flooding and other dangerous conditions. The Hungarian authorities said that it used the fictional locations for the test for two reasons: Firstly, it didn't want to cause a panic among the citizens, and secondly, it wanted to ascertain how well the emergency message reached Hungary's youth. Anyone who's seen Fellowship of the Rings already know that the areas around Rivendell sometimes suffer flash-floods, possibly brought on by deforestation and elvish magic. Reports suggest that a recent occurrence, which claimed the lives of a number of NazgÃ»l, may also have had something to do with spectral horses. It's unusual that Gondor is also seeing such inclement weather, and the people of Minas Tirith are advised to stay in their homes, where they should be safe unless sea level unexpectedly rises a few hundred feet. Joking aside, using fictional, but familiar, locations as a way to gauge the effectiveness and reach of an emergency broadcast system is actually quite a interesting idea. It would also be interesting to find out how the authorities determined the effectiveness of the test, which would presumably involve monitoring social networks along with other, more traditional, information gathering methods.